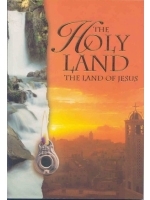 A pictorial pilgrimage through the Land of Jesus showing all the places familiar from the Bible. Nazareth - city of the Annunciation, Bethlehem, the Sea of Galilee where Jesus preached and prayed, Jordan - place of baptism, and Jerusalem, site of Jesus’ Passion. Unique pictures of interiors of Churches, religious processions and historic sites.